Hamlet was established in 1990 and offers an affordable, excellent value self-catering holiday apartment in a unique and quiet location: St. Katharine Marina is a hidden treasure situated on the North bank of the River Thames, adjacent to two of London's most famous landmarks namely Tower Bridge and the Tower of London. 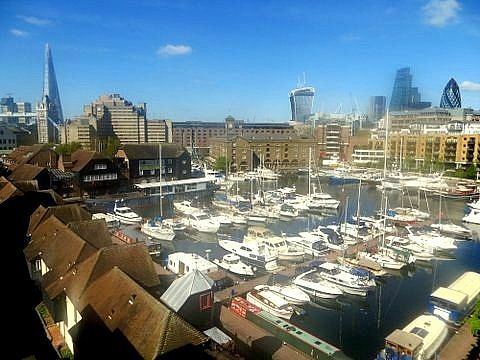 The flat overlooks the yachting Marina which was redeveloped in 1973, situated about 5 to 7 minutes walk from Tower Hill tube station served by the District and Circle Lines and from Bus services into the West End of London and major landmarks and tourist attractions. Business guests will find the apartment conveniently located within easy reach of "the city", London's business and financial district. We tend to cater mainly for guests who are looking to sample life in real old London and looking to stay in an affordable, quiet, comfortable, clean and apartment moderately priced and situated in an atmospheric and charming area of London. A half bathroom (sink and bath tub and shower). Separate WC and sink. Notes on accommodation: Please contact owner. Outside: There is a patio with outdoor furniture accessed from the lounge. Utility Room: Washer/Dryer Cleaning / Towels / Linen / Maid service: You are provided with a set of towels each and all bed linen and covers free of charge. Service can be arranged during your stay at minimal cost. City breaks, tourism and business. The nearest tube station is Tower Hill on the District and Circle lines. The nearest DLR station is Tower Gateway. The nearest bus stop is in Thomas More Street 150 yards from the apartment block, route number 100 between Shadwell and Elephant and Castle, which will take you to Tower Gateway and Liverpool Street Stations. The Tower of London and Tower Hill are about 5 to 10 minutes walk from St. Katharine's Marina. Changeover Day: We do not have a specific change over day. Your reservation can start any day of the week.